You may not be aware of it but depression negatively affects productivity in the workplace. According to a 2001 study published in the Annals of Internal Medicine, about 9.5% of the adult population or approximately 18.8 million Americans will suffer from one form of depressive illness or another in any given year. Interestingly enough, depression is ranked as the most prevalent mental health issue among older adults. Depression affects all aspects of life. It can increase the risk for alcohol and drug addiction, ruin relationships and increase a person’s risk for self-injury and suicide. It can even cause serious problems at work. According to a study conducted by the National Center for Health Statistics from 2005 to 2006, 80% of people with depression experience some level of functional impairment as a result of the condition while 27% claimed that the condition caused severe difficulties in their work and home life. However, only 29% contacted a mental health professional to have their condition treated. Depression affects productivity in the workplace in more ways than one. It increases the rate of absenteeism, presenteeism, productivity loss and disability among the working group. According to the data collected by the Centers for Disease Control and Prevention (CDC) from various credible sources, people with depression miss an average of 4.8 workdays and suffer 11.5 days of reduced productivity. 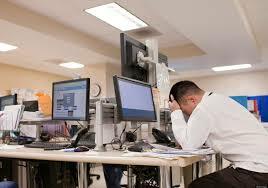 Depression also gave rise to a phenomenon known as “presenteeism” or being on the job but not working productively. This alone costs employers about $44 billion a year in lost productive time. Recognizing the serious implications of the problem, here are some ways that you may use to overcome depression in the workplace. Conduct worksite climate surveys. This can be used to collect data pertaining to job demands and the relationship between co-workers, and determine if the employees are getting the support they need from their supervisors and colleagues. Recognize the warning signs. Create a corporate culture wherein everyone looks after another’s well-being. Teach your employees to recognize the early warning signs of the condition (tardiness, fatigue, reduction in work output or quality, safety problems or accidents, and changes in attitude) and report any incidents to the proper authority for screening and treatment. Provide Employee Assistance Programs (EAPs). Active EAPs can support employees with depression by providing counselling and referral services. Provide worksite health promotion programs. Having a dedicated and effective corporate wellness program that incorporates physical activity and lifestyle change programs can lower the incidence of depression in the workplace.